Also, when is our official review coming out? These prices are tempting, but I can't buy without reading the review. What we're going to see now is a whole lot of posts saying that the pricing is good followed by others saying that they should have priced it 25k below the Creta or thereabouts for it to be a success, opportunity lost by Tata, why Tata why. In my opinion, Great pricing! 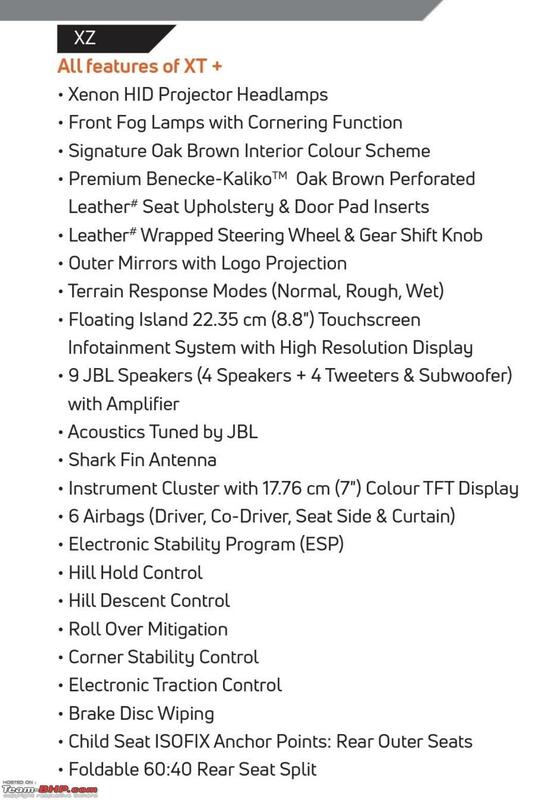 Also worth a mention that this gives them some room to price the automatic whenever they get around to launching it. Fit and finish can certainly not be below the competition, which in this case will inevitably be the Creta when comparing seating capacity rather than size. any first drive reports out yet? You must be new to this thread. Please go back a few pages or search YouTube, there are several first drive reports. Last edited by VeluM : 23rd January 2019 at 13:08. Reason: Forgot to mention. Spot on pricing by Tata. I was expecting the prices to be in 11.99-15.99 range and they have only exceeded it barely. 3 out of the 4 variants are priced lower than the Creta SX(O). I can foresee some cross shopping to take place between the prospective customers of these cars. 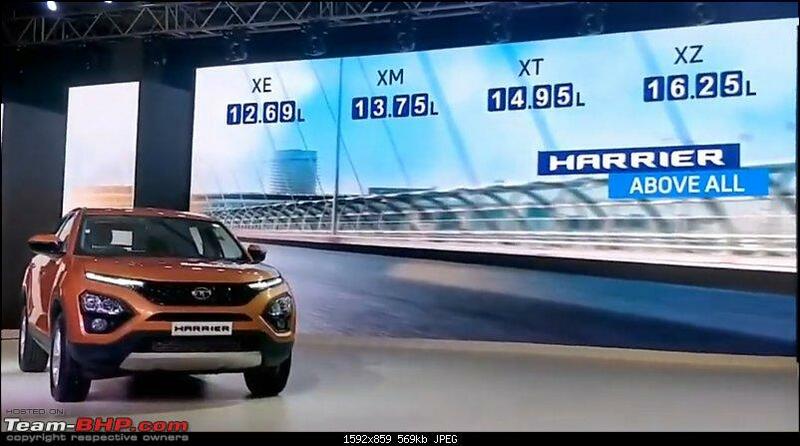 For your moolah, Hyundai will offer you the brand name and the goodwill it has gathered over the years along with a well sorted product while the Tata will offer you a unique design, Land Rover pedigree and of course a car from the next segment. However, its main competition will come in the form of the XUV 500. 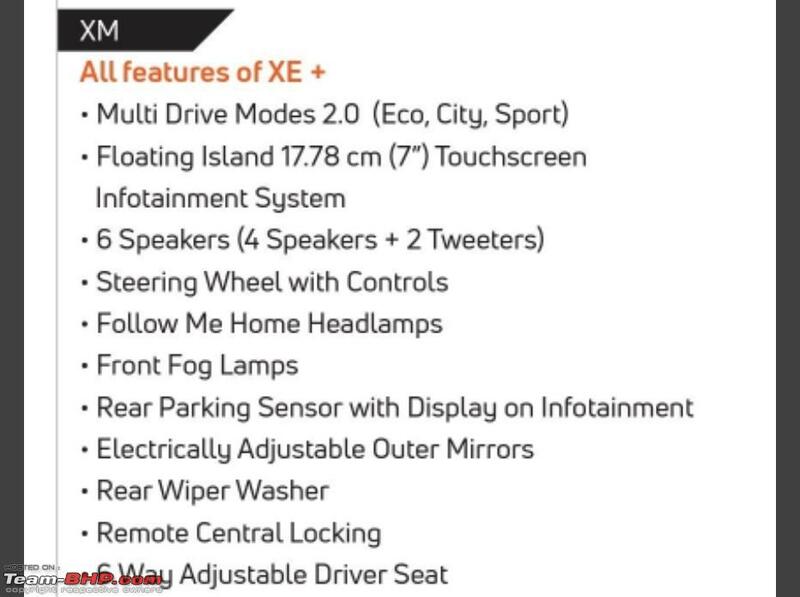 Both the cars are priced at par with each other for the lower variants, however the top end XZ actually competes more with the XUV W9 than the W11. That leaves them with enough scope to come out with a true top end variant in the near future. Maybe Tata decided against this to avoid the shock sticker price. That being said, they should not be delaying it much as most of the XUVs that I see on road are the higher variants. The XUV does have the size and feature advantage over the Harrier. While Harrier has its own strengths. Suddenly the Jeep has started to appear pricey, let alone the Tucson. If Tata has managed to eradicate the quality issues and the usual niggles that we associate with them, I don't see why this car won't be a success. It is difficult to put a tab on the number of units it will sell if it 'succeeds'. 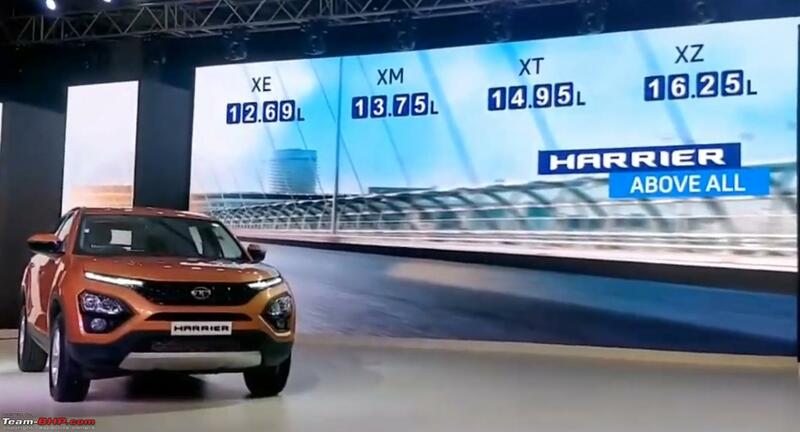 On one hand, we have the Creta with its strengths backed by the Hyundai brand name selling around 10k per month and on the other hand we have the XUV whose sells have now settled around the 2k mark. The Jeep Compass which sells around 1k is the closest competitor to the Harrier but its in a different ballpark altogether. I would call this product a success if it can sustain sales of around 3k per month. Last edited by AYP : 23rd January 2019 at 13:11. 1. Way ahead chassis and engineering - Creta is a 'hatch' and XUV nearly a decade old work (still works, though). I have a 2013 XUV and it works great. 4. 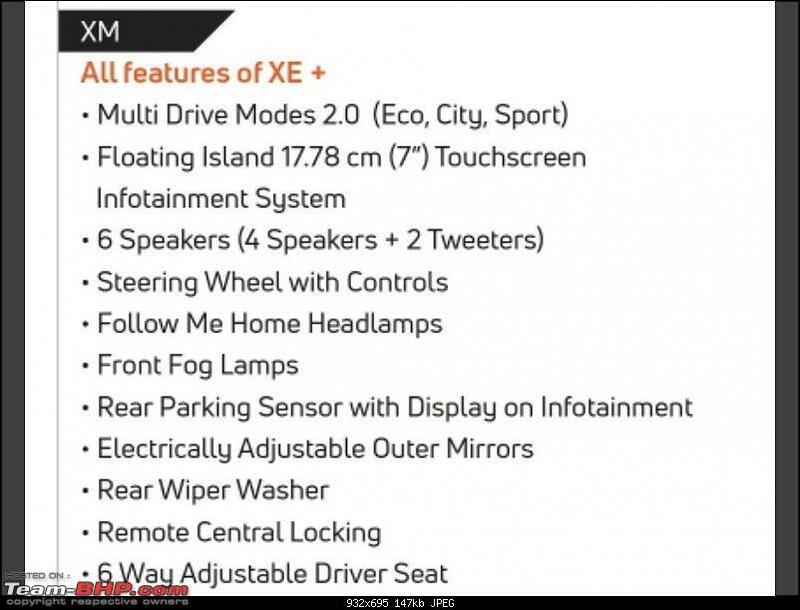 XZ+ will fix sunroof, electric seats, better/bigger alloys issues and will retail at around 20-21 on road. Beat that. 5. Most likely, it will be safer than all the competition it faces. XUV, in particular, is poor on safety, I think. This one has the show and the go. This product from Hyundai would have cost at least 4L more. And maybe 5-6 more from Ford stable. No rationale whatsoever in comparing Creta with either the XUV or the Harrier. Think of what international brands do to us and how these brands fleece us. Kudos to Mahindra and Tata for doing things right, again and again now. Seems rather optimistic for an absolute bare bones variant. They said starting 12L on road. This is easily 15.5L on road. Last edited by JS Kwt : 23rd January 2019 at 13:14. Good pricing. But, yes, could have been 30 to 50k lower, at least as Intro pricing. Base could have been 11.99, just for sticker value. As of now should be shade above 20 OTR if my calculations are correct. Definitely scope for a XZA and XZ+ variant in the future. They said starting 12L on road. This is easily 15.5L on road. Quite incorrect. They have maintained 16 - 21 on road from the beginning. Last edited by Mu009 : 23rd January 2019 at 13:16. But this is just a guess from my side! Generally I have seen in past 3-4 launches that my guesses are within 30-40k of the actual launch price! The launch prices seem introductory and I am sure Tata would increase them soon after they get a good amount of bookings. 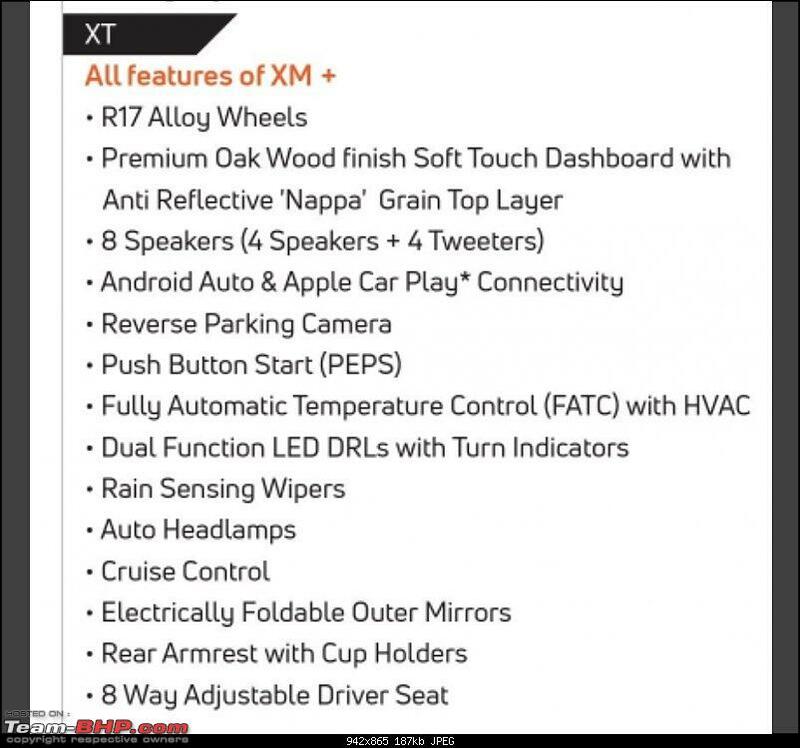 The prices seem quite fair and Tata only need to ensure that the interior fit and Finish is consistent and tight and that the performance of the car is upto expectation. Pricing seems to lock-horns with the Creta. What will be the rough translation when we want to get on-road. Spot on pricing IMO. I remember reading somewhere that the Harrier engine is already BS6 compliant. With some manufacturers already claiming that the introduction of BS6 norms is going to cause a significant increase in the price of their diesel engines, the pricing of the Harrier seems even more intriguing. Personally, I would also like to see a petrol option on the Harrier given the changing market dynamics. Would be a perfect contender when I decide to upgrade from my Ecosport. 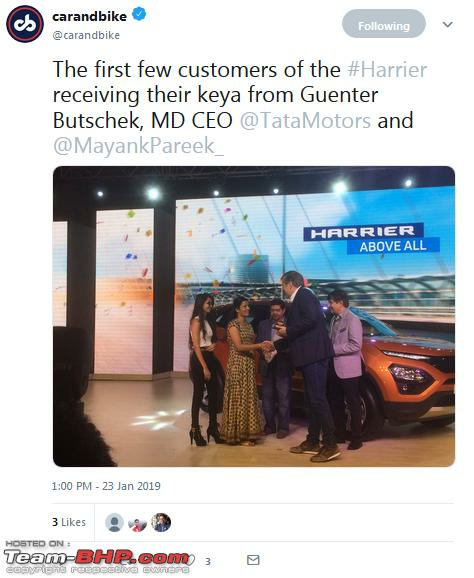 First deliveries for the Tata Harrier begin today and right at the launch function. Lucky customers who had purchased the Harrier were called on stage and awarded. They were presented with the key from Guenter Butschek. Last edited by amrutmhatre90 : 23rd January 2019 at 13:23. Mod note: Back to back posts. Please edit the original post if editing within 10 minutes. Little bit on higher side, with auto box it will be 17.5 to 18 for top end. 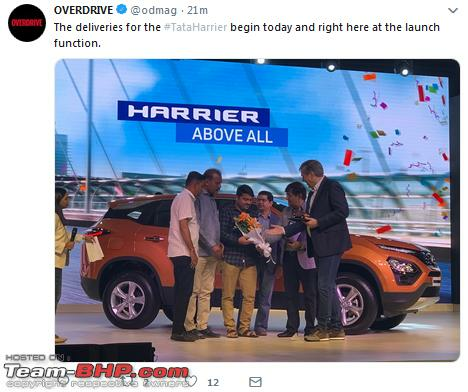 First deliveries for the Tata Harrier begin today and right at the launch function. Lucky customers who had purchased the Harrier were called on stage and awarded. Last edited by Jaggu : 23rd January 2019 at 13:31. Reason: Back to back posts. Please edit the original post if editing within 10 minutes. I think the pricing is okay. Nothing to complain about, nothing to write home about. By the way, remember my earlier post? 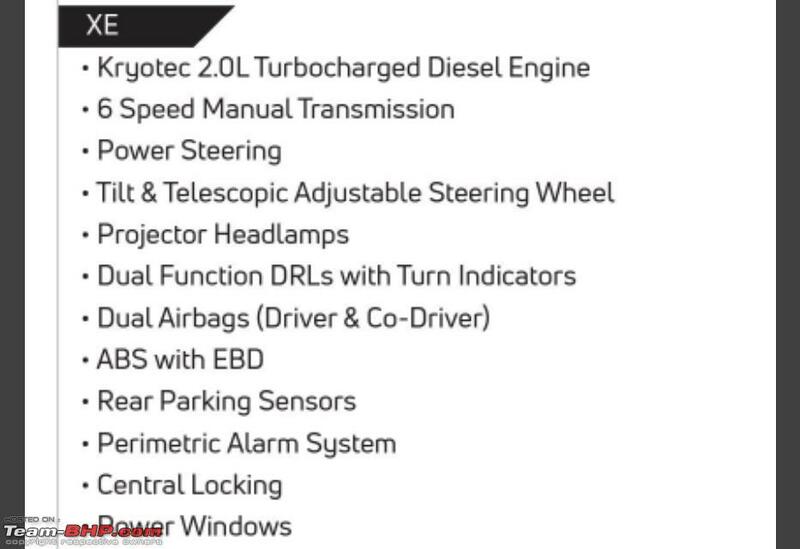 Tata's Twitter handle & Autocar intentionally leaked the 16 - 21 lakh price, only to launch it lower eventually. The base variant starts significantly lower in Delhi or MH (Tata's home state), as does the top variant. 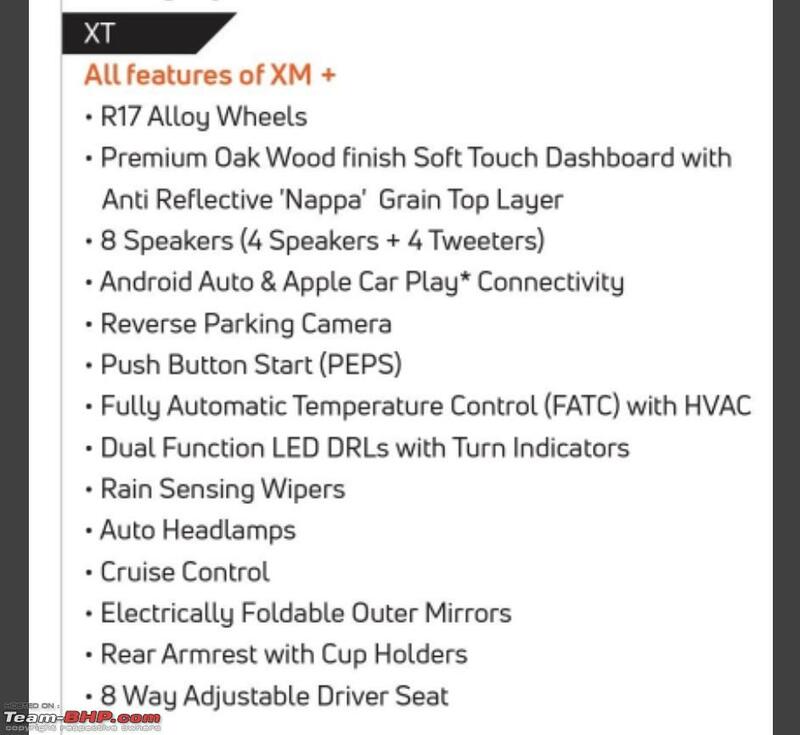 Forget ex-showroom (which is usually how prices are announced or leaked), even the on-road is lower. I hear from a fairly reliable source that the entire "pricing leak" was a big sham. It was a play by Tata & the media. The Harrier is actually going to be priced lower than that. 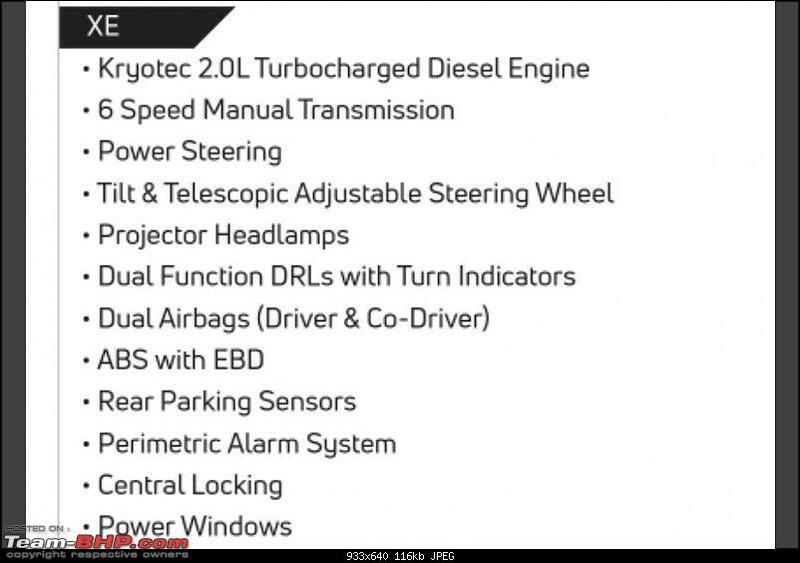 Consider that the Creta (which is by itself overpriced) top-end retails at 18.4 lakhs on the road in Mumbai. 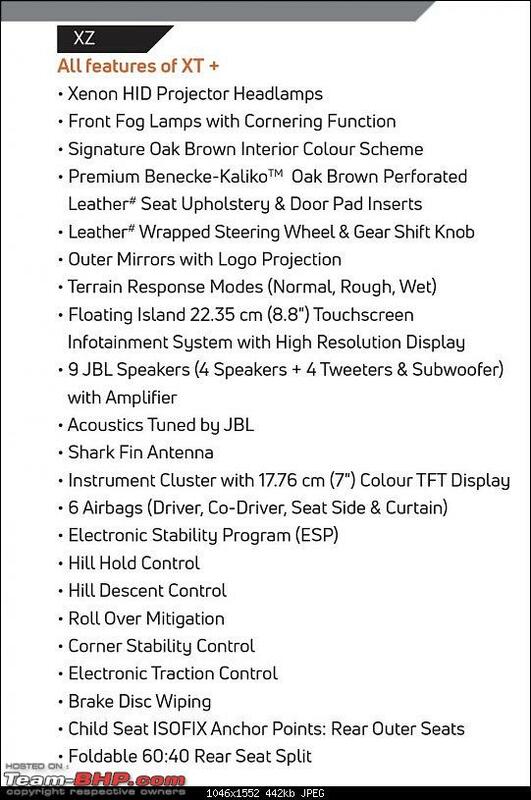 A Tata product about 3 lakhs higher? Destined to sink. Tata still has very bad memories of the Aria and isn't inclined to repeat them. The birdie insists that the pricing was intentionally leaked to be higher than actual, so that when you see the real price, the perception is of VFM. And for the record, the prices have NOT been finalised even by Tata's top management. That's also why the leaked prices made a reference to "onroad" pricing. "Onroad price" without sharing the city is as vague as things can get. E.g. a 10-lakh rupee car in Delhi can cost 12-lakhs in Bangalore. Agreed with Fiat3031. A new car's pricing is as closely guarded as India's nuclear missile launch codes. Additionally, they are sometimes changed at the last minute due to external developments (e.g. stock market crash). 1. To gauge the market's reaction to the leaked prices & tweak them accordingly. 2. To prepare the market for premium pricing (best example is the Harrier's recent pricing "scoop"). P.S. Before any Bangalore BHPian replies talking about how the Harrier might cost 21 lakhs there, please note that car launches almost always have Delhi prices quoted. Last edited by GTO : 23rd January 2019 at 13:26.